Everybody wants in on the astronomical action, including big brands from fast food to eyewear. With Eclipse Day upon the US, and the rest of the world watching the fervor with bemusement, brands are getting in on the trend with campaigns ranging from clever to cringeworthy. This is the first total solar eclipse in the US since 1918, a time when advertising was often just a guy yelling on a street corner, so companies are enjoying the opportunity to try out entirely new tactics. From DIY tutorials to over-the-top jokes, here are some of the universally lighthearted spots celebrating the celestial alignment. As almost all of them take care to note, don’t look straight at the eclipse—the damage can be permanent, which will make enjoying the next full eclipse in 2024 a lot harder. 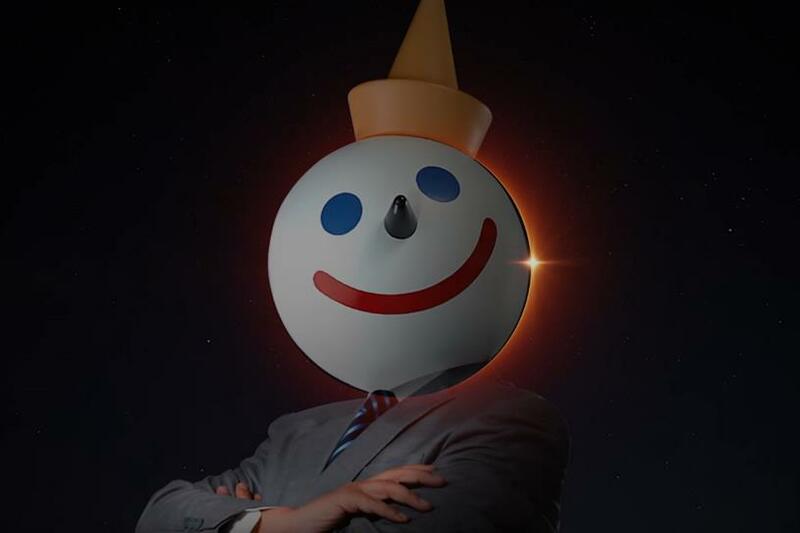 Jack in the Box’s tongue-in-cheek eclipse promo announces a literal moonshot project from the fast-food chain years ahead of the first SpaceX mission. Elon Musk, eat your heart out: Jack (the one in the box) wants to raise $66 trillion to land an enormous replica of his cone hat on the moon. Poking fun at brands’ blatant exploitation of the eclipse to promote themselves, the clip ends with a voiceover praising the initiative as "One small step for man, one giant marketing opportunity for Jack in the Box." There’s a nice ending here, though. Clicking "donate" over at the Project Moon Hat site, after admonishing visitors for trying to throw their money at "something crazy," redirects to No Kid Hungry, a child hunger charity that Jack in the Box raised $275,000 for last year and will partner with again this September. Unlike most brands jumping on this blackout bandwagon, Warby Parker’s product aligns as perfectly with the eclipse as the moon will with the sun. Assuming permanent eye damage is not on today’s to-do list, specialty glasses are required for viewing, so Warby Parker stepped up to provide them in its retail stores. Although their eclipse specs are just about sold out, the "Total Eclipse of the Heart" parody video Warby Parker released earlier this week is still around and makes a fun, silly pregame for the main event. As previously lamented, Warby Parker’s out of eclipse glasses, and the window of time to find others is almost closed. Not to worry: Corona has a solution, one that conveniently requires the purchase of a 12-pack. Their how-to video for making a pinhole viewer offers easy, step-by-step instructions on how to turn an empty box (Corona or otherwise, but they’d really prefer it be Corona) into a safe alternative to NASA-certified glasses. It’s probably a good idea to make this before drinking said Corona, since inebriation can only encourage carelessly staring directly into the eclipse—and that damage is going to last a lot longer than any hangover. Only a small portion of the US lives within the geographical band where the eclipse will be total, so Chiquita seized upon the partial eclipse’s resemblance to a banana and made a populist ad aimed at everyone else. Claiming that they’re going to "physically move the moon" to make "an enormous, fiery yellow banana in the sky," Chiquita also takes the opportunity to remind eclipse viewers not to look at the sun, banana-shaped or otherwise. Like Corona, Malibu made an ad winking at the work-ditching and day-drinking undoubtedly accompanying many of today’s eclipse-viewing parties. But they went a little further, creating an entirely new type of celebration specifically for the occasion: a Malibu-centered Black Moon Party, complete with Malibu-made viewing glasses. Because EVB is anchored in Oakland, CA, that’s where the ad is set—even though the city is outside the full-eclipse band and will only get to witness a 75 percent cover. Still a good enough excuse for a cocktail, says Malibu!